Say hello to Max. I found him a few days ago when I was running. I ran by the parking lot of out favorite bakery and there he was. He was limping on his right rear leg and he was about 10-15 pounds underweight. As I was looking at him I told him, "I'm not finishing my run today, am I?" The answer to that was no. We don't know what caused his right rear leg problems, but we (me, Mr$. bonddad and the vet) think he was hit by a car. The ball has been shattered. But there is an operation to get him healed up that we're going to do a week from Monday. But -- here's the problem. We already have three dogs and we just don't have room. Max is about 1 to 1 1/2 years old and is really nice. He is strong, but that's a breed trait. Once you sit him down and start petting him he will lick your face just like a puppy. 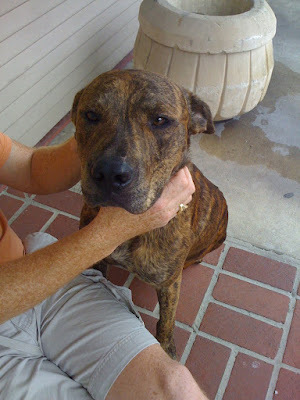 So -- for all the bonddad blog readers who are also dog fans -- we could use your help. If you are interested in taking him in, please leave a comment below. We will happily work with you to get him where he needs to go. Thanks for helping if you can. And spread the word -- max needs a home. First, consider that at the beginning of this year we were losing 600,000+ a month. Now, let's assume a gradual easing of those problems at at 50,000/month rate. That would get us to a current level of a 250,000/month loss rate which is slightly worse than where we are currently. Here is the point of this exercise: an economy that is shedding jobs at a 600,000+ rate does not turn around and start creating jobs within 6 months; it just does not happen. An economy that goes through a period of losing 600,000+ jobs/month can more or less expect to have a dead year ahead. That -- simply put -- is reality. Today's figures are on track with a slow but steady improvement in the establishment jobs market. At the pace we are going we should be printing right around 0 within 6 months. 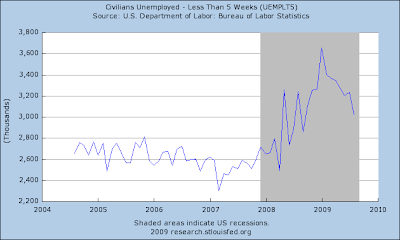 The number of people unemployed for less than 5 weeks have been decreasing since the beginning of the year. 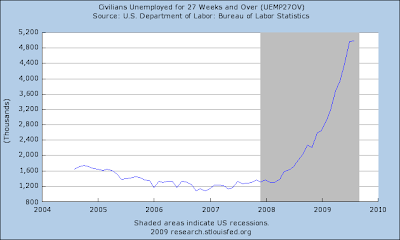 The number of people unemployed for more than 27 weeks increased but at a far slower rate than previously. 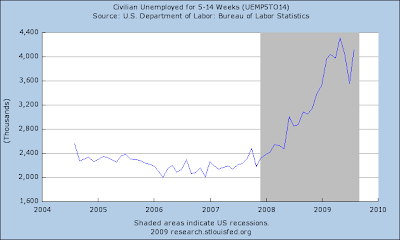 In other words, of 4 different lengths of time that people are unemployed we saw improvement in three of the metrics. And one of those time frames -- the less than 5 weeks period -- has been decreasing since the beginning of the year. That means we can probably expect to see continued improvement in these numbers going forward. The unemployment rate comes from the household survey which shows in increase in the civilian labor force of 73,000 and an increase in the number of unemployed of 466,000. The above chart also shows that the rate of decrease in various job sectors is moderating. Note the month over month losses are -80 for service industries and down -136,000 for goods industries. There are three other interesting data points. The number of people working part-time for economic reasons has leveled off since the beginning of the year. The number of discouraged workers (Discouraged workers are persons not currently looking for work because they believe no jobs are available for them) may have topped out for this cycle as well. Overall I'd call this a lukewarm report. 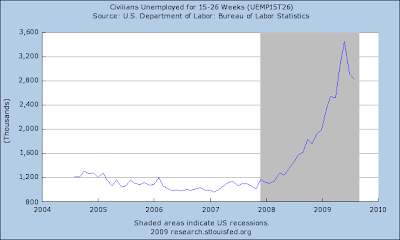 I don't like the increase in the unemployment rate, but it's not surprising. The overall rate of job losses are still moderating, the rate of individual losses in various industries are decreasing and two measures of labor under-utilization (part-time for economic reasons and discouraged workers) appear to be topping. The weekly chart is interesting. While prices have been dropping, there are three elements to this chart possibly pointing to a rebound. 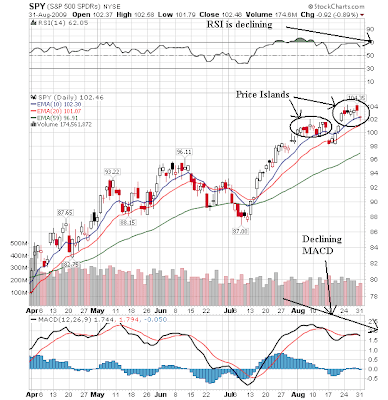 First, the MACD is approaching a buy signal. Secondly, the RSI is at low levels (although it could still move lower). Finally, prices aren't moving lower in a solid line. Instead, they're moving lower in price groups, forming triangle consolidation patterns on the way down. However, arguing against this theory are the EMAs which are in a very bearish configuration -- all are moving lower, the shorter EMAs are below the longer EMAs and prices are below all the EMAs. 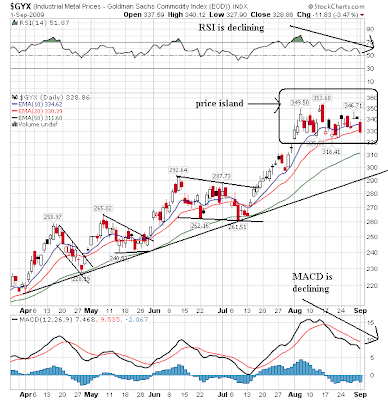 There is a huge divergence between the MACD and prices. 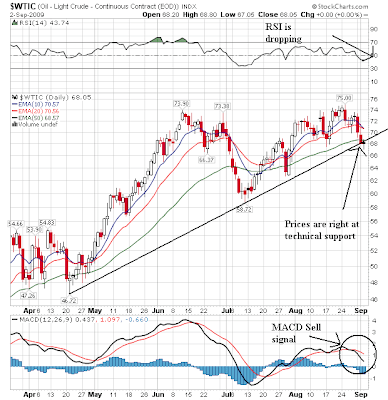 Prices have been moving lower since June, but the MACD has been increasing. This type of technical divergence is something that traders look for in a reversal. In addition, note that prices are currently in a triangle formation with a rising base. This tells us that the low price where traders find value in the dollar is increasing. In addition, prices and the EMAs are in a very tight pattern indicating an overall lack of direction. In short, there are many signs that the market wants to move higher. Will it is another story entirely. The main price action for the day was in the morning when prices fell to yesterday's support. But prices moved higher from there and eventually ended up .85%. However, the real issue is tomorrow's jobs report; that is where the rubber will meet the road, as it were. Note the jump in export orders -- they're back in positive territory. Inventories are still dropping. But at some time, these will have to be restocked. The rates of GDP decline are clearly slowing. In some countries we are seeing positive GDP prints. Although banks are still tightening credit, the percentage of banks doing so is decreasing. Bottom line: the stage is being set for growth. 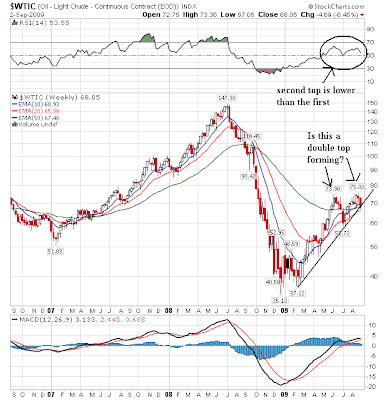 The question on the weekly chart is still whether or not prices are forming a double top. To that end we clearly have a second top forming and a weaker RSI reading on the second top -- although the MACD is still rising. Also note the 10 and 20 week EMAs are still moving higher as well which is also bullish. On the daily chart, prices are right at a trend line. 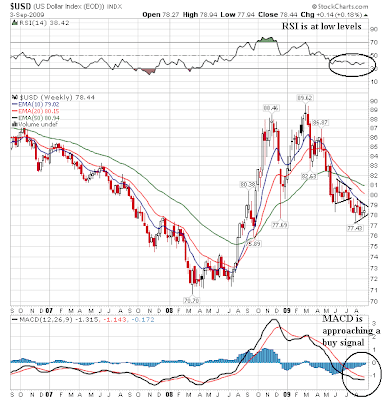 In addition, prices are now below all the EMAs and the MACD has given a sell signal. In addition, the RSI is dropping. There are cracks forming in all the charts, but there has not been a definite price move lower. That is the main thing the bears need right now. There are several reasons to set-up into a bearish position but then it's a waiting game. 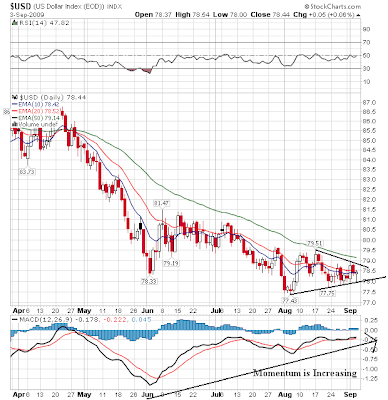 First, note that the Treasury market is breaking out. It has moved through upside resistance and has now crossed the 200 day EMA -- a move into bull market territory. But, considering the massive supply issues that are coming on line this is a bit hard to believe. The SPYs were a bit anemic today -- which is actually a good thing considering their drop yesterday. Notice that at the end of the day prices attempted a sell-off. But despite increasing volume prices just didn't move lower by a large enough amount. Orders from U.S. and foreign businesses for capital equipment rose for the fourth straight month in July, the Commerce Department reported Wednesday. Factory orders increased 1.3% in July, slower than the 2.0% growth that economists surveyed by MarketWatch had been looking for. Economists believe that the nation's manufacturing sector may finally have turned the corner. On Tuesday, the Institute for Supply Management reported growth in the group's manufacturing index for the first time in 19 months. See full story. Orders for durable goods increased 5.1% in July, revised down from 4.9% estimated a week ago. Orders for nondurable goods fell 1.9%, the government's data showed. Meanwhile, shipments of factory goods were barely negative in July, and have fallen in 11 of the past 12 months. Shipments are down 19.9% in the past year. Inventories fell 0.7% in July, marking an 11th straight monthly decline. Analysts believe the behavior of inventories over the next few months will say a lot about the economy's ability to recover from the worst recession in 70 years. The news release from the Census notes the new orders have increased 5 of the last 6 months. Inventories of manufactured durable goods in July, down seven consecutive months, decreased $2.9 billion or 0.9 percent to $313.7 billion, revised from the previously published 0.8 percent decrease. This followed a 1.5 percent June decrease. Inventories of manufactured nondurable goods, down eleven consecutive months, decreased $0.7 billion or 0.4 percent to $189.4 billion. This followed a 0.4 percent June decrease. Plastic and rubber products led the decrease, down $0.4 billion or 2.0 percent to $18.9 billion. 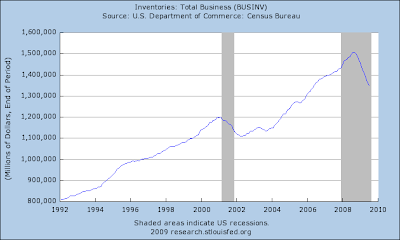 At some time, those inventories will have to get re-stocked. Yesterday's strong ISM manufacturing report got me wondering if there was any correlation between that report and the employment report. 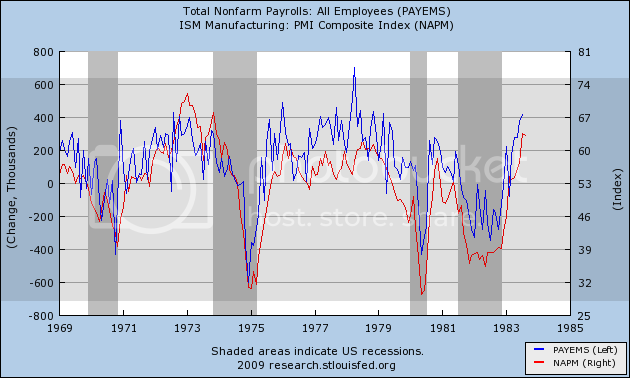 Specifically, how often has expansion in manufacturing nevertheless been accompanied by a decline in employment? So I dug through the data, and I give you the following graphs. It seems to me that there is a very, well, graphic, correlation, but you be the judge. Data confirms that in these traditional recoveries, an ISM manufacturing reading above 50 correlated with actual job expansion. Once again, the correlation is striking, but this time, there were some weakly positive ISM readings that nevertheless were accompaied by negative jobs reports. Let's look at that in a little more detail. The 1991 recession ended in March, but employment hit it's nadir in May. Unemployment didn't peak until June 1992. Now let's look at the 2001 recession. Despite ending in November 2001, unemployment did not peak until June 1993, and employment continued to decline until August 1993. 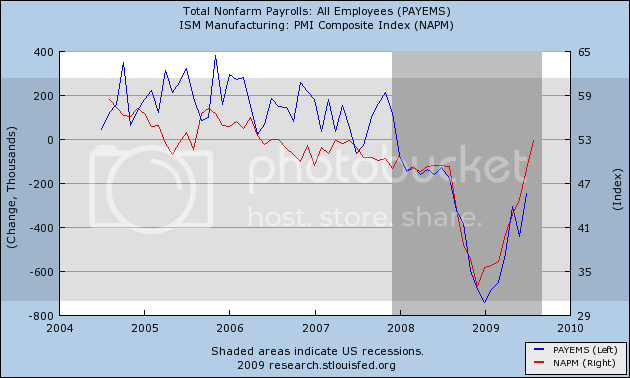 Compare with the August 2009 ISM reading of 52.9. The very worst jobs number in either of the two prior "jobless recoveries" where the contemporary ISM report exceeded 52.0 was ( -85,000). The worst for any reading above 50.0 was ( -156.000). At no time has there been a reading of 54.0 or above on the ISM manufacturing index during a "jobless recovery." All such readings have coincided with jobs growth and unemployment rate declines. Once again, there appears to be a very strong correlation between the two reports. Needless to say, I haven't had the time to dig through all of the data in depth. 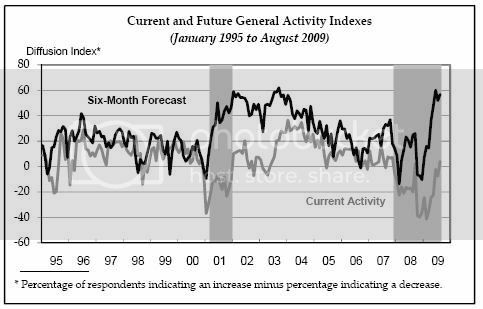 It certainly could be that there is an ongoing secular change which means that ISM readings must be even more positive than in either 1992 or 2002 to generate positive jobs data. It could also be that strength will turn up first in aggregate hours worked, average workweek, and overtime, before it turns up in the jobs number itself. But laying that aside for now, if this recovery's data is in accord with the past two "jobless recoveries" in terms of the correlation between the two data series, then Friday's jobs report could be a surprisingly "strong" (0) to (-150,000), which is why I wanted to put the graphs and data up for you now. China has been pulling out of the global slump more decisively than any other major economy, thanks to an enormous stimulus program. A survey of purchasing managers at Chinese companies, which signaled expansion beginning in March, moved up to 54 in August from 53.3 in July. Japan reported an upturn in industrial production earlier this week. It said industrial production in July rose 2.2% from June, the best monthly gain since the global recession hit. The euro zone's purchasing managers' index rose to 14-month high of 48.2 in August, up from 46.3 in July, closing in on the 50 level that would indicate activity has stopped falling. The surveys showed manufacturing in France is growing again, and has nearly steadied in Germany. But in some countries, such as Italy, Spain and Ireland, manufacturing declines continued. As in the U.S., European businesses have cut inventories so sharply that even a modest revival of demand is likely to lead to increases in production. The numbers are picking up across the globe. Yes -- there are still issues. But it's important to remember that no economy turns on a dime; there will be lingering problems that must be dealt with. But the signs are there that the world economies are turning around. The weekly chart shows a strong rally. 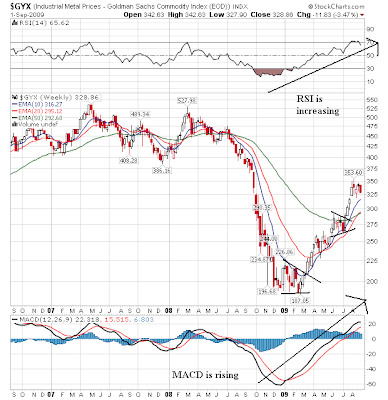 The MACD and RSI are increasing and have been since the beginning of the year. All the EMAs are moving higher, the 10 and 20 week EMA have moved through the 50 week EMA and prices are about the EMAs. On the daily chart we see a strong rally. First, prices have been in an uptrend since the beginning of April. All the EMAs are moving higher, the shorter EMAs are about the longer EMAs and prices are above all the EMAs. While the MACD and RSI have been dropping, notice they did this for the other consolidation patterns in the rally as well. The big issue on the daily action is the price chart in the morning; prices dropped about 2%. Then they meandered sideways for the remainder of the day. In the U.S., the manufacturing sector grew for the first time since January 2008; the key gauge of this, the Institute for Supply Management's manufacturing index, rose to 52.9 from 48.9 the previous month, driven by improvements in new orders and production. Levels above 50 indicate growth. Meanwhile, the purchasing managers' index for China swung into expansionary territory in March -- well before other nations -- and has stayed there ever since, but Tuesday's reading of 54.0 for August show activity expanded at its fastest pace in more than a year. And Japanese industrial output rose 1.9% in July, beating expectations. The positive signs come on the heels of another report Tuesday showing similar strength in Europe. Though still contracting, the euro-zone manufacturing purchasing manager index rose to 48.2 in August from 46.3 in July, a 14-month high. The improvement came on the back of gains in Germany and France, but Spain and Italy posted declines. The U.K. showed unexpected weakness, as the nation's manufacturing sector shifted into contractionary territory. August's reading came in at 49.7 from 50.2 a month earlier. Still, the August improvement in the U.S. is notable because many of the industries that improved aren't linked to automotive production. That signals an improvement in demand apart from the Cash for Clunkers program, which let people trade vehicles in for a credit toward more fuel-efficient models, helping boost consumer spending and manufacturing. New orders were a driving force behind the manufacturing gains in the U.S., rising almost 10 percentage points to 64.9. Production and supplier deliveries, which tend to be tied to improvements in new orders, also rose. In the midst of all the good news, hiring was still a weak spot in the U.S. manufacturing report. The index shows that employment was still contracting and some companies noted in their comments that layoffs were still ahead. Separate indicators released Tuesday showed mixed signs for the construction industry. The National Association of Realtors' pending home sales index rose to 97.6 in July from 94.6 in June. But construction spending feel 0.2% in July to a seasonally adjusted annual rate of more than $958 billion compared to the prior month, the Commerce Department said. With hiring still struggling and housing working toward stabilization, healthier foreign economies could buoy the U.S. recovery. The manufacturing report's exports index climbed five percentage points to 55.5 in August. "Apparently the dollar is at a level that foreign demand is going to be reasonably strong, said Norbert J. Ore, chairman of the ISM manufacturing survey. "That will also help us through the balance of the year if it continues." Now that Bonddad and I are both on record that the Recession has ended, the focus shifts to what the Recovery will look like -- what are the engines of growth, how robust will it be, how long will it last, how widely shared will the benefits of growth be? Bonddad's excellent post from yesterday describes a "Fits and Starts" recovery, while I suspect the chances for a V-shaped recovery are much greater than almost anybody else anticipates. I further suspect that this will be an old-fashioned recovery, where manufacturing leads the way. In that regard, the 72 hour period from this morning through Friday morning will give us a slew of data about the strength of the manufacturing rebound. Yesterday's Chicago PMI reading of 50.0 was the third surprise in several weeks, after both the New York and Philadelphia regions showed a dramatic shift to growth. This morning's ISM manufacturing reading of 52.9 was not only significantly higher than estimates, but according to the ISM, "the highest since June 2007." The New Orders Index surged, "up 9.6 points to 64.9 percent, the highest since December 2004." The deliveries index, a leading indicator, also improved to 57.1. Inventories shrank, meaning that replacing goods on shelves will require more manufacturing in the future. The only negative part of the report was that employment at 46.4 is still in contraction, although less so than before. Later today we get auto and truck sales, which will almost certainly also show a dramatic pop due to "cash for clunkers." Tomorrow brings us factory orders. We already know that durable goods showed surprising strength, but should new orders for nondurable goods not swoon, that will make the final, 10th Leading Economic Indicator to have a positive 6 month reading, making it a a virtual certainty that economic growth is already happening. Friday ends the week with a bang. Although the employment number will receive the most attention, manufacturing workweek and overtime are also reported. Strong numbers for these will support the V-shaped recovery hypothesis (as did, e.g., the strong new orders component of ISM today). And last month manufacturing lost only 52,000 jobs, after having lost in excess of 125,000 every single month previously this year. 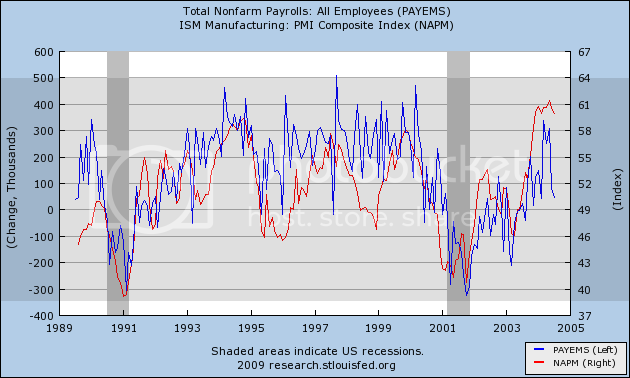 It is at least possible that jobs could have been gained in manufacturing in August. In short, this week the data will begin to paint the picture of the recovery in earnest. A similar index covering the heavily industrialized Milwaukee region rose to 56 in August from 45 in July, while the Dallas Federal Reserve Bank said factory activity in Texas declined in August but at a slower pace than in July. Meanwhile, business activity in New York City, which tends to be driven by trends in the financial sector, expanded in August for the first time in three months, thanks to increased purchases and a slowdown in layoffs. The National Association of Purchasing Management-New York index of business conditions rose to 55.3 from 48.3 in July. Improvements in purchasing volume and employment conditions signaled the worst of the city's downturn might be ending, the group said. This is encouraging news as it indicates it's not just one number causing the increase. Together these chart paint a picture of a sector on the rebound. It's important to remember where we are in the cycle of things. Look at the price levels from the beginning of the chart to roughly mid-2007. These levels occurred during an economy that was growing slowing and heading into a recession. But also remember there was no credit crunchy at that time. Then look at the large rally that took place from mid-2007 to the early part of 2009. This rally occurred because of the credit crunch. Now prices are coming down from that level to more "normal" levels. In this situation, "normal" means we're getting away from the credit crunch and into more normal, less-stressed value levels. 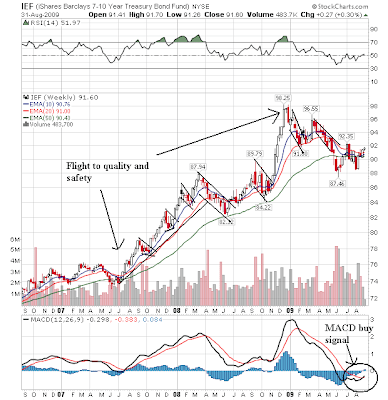 However, notice the MACD has given a buy signal and the RSI is right around 50. Also note that prices and the EMAs are in a very tight range indicating a lack of overall direction. 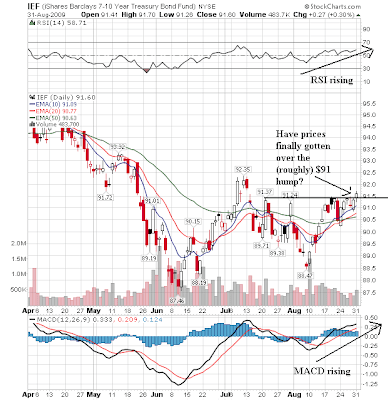 On the daily chart we have a rising RSI and MACD along with prices making a move about the (roughly) $91 level. Also note the 10 and 20 day EMAs are moving higher and both have crossed over the 50 day EMA. Fundamentally let's ask ourselves what's going on. There has been talk of the need for a market correction for some time. That would lead to a flight to quality and safety and therefore a Treasury rally. However, there has also been tremendous Treasury issuance over the last few months which is going to continue for the foreseeable future. That means the market must continually absorb a ton of supply as it comes out. In other words, there are tremendous cross-currents in the market right now. Once the market dropped today's action was pretty much over. There was a cup and handle formation that occurred throughout the day, the but volume spike at the end of the day was insufficient to more the market higher. First, we have two price islands which are usually considered to be reversal formations. In addition, there are lower MACD and RSI readings on the second, higher top. That's not good either. Chicago's PMI hits the dead-even 50.0 mark in August, indicating no change in business activity from July and a bottoming for the recession in the region. The results, along with indications from other regional surveys, point to similar no-change 50 readings for this week's ISM national reports. Chicago's report showed a huge nearly 10-point jump in production to 52.9 in a reading that indicates output actually rose in August. The rise in output put stress on the supply chain as deliveries slowed, to 54.9 for a 5 point rise. Orders are moving into backlogs with the index showing one of the biggest gains of any component, up nearly 14 points to 45.8. To meet production needs, Chicago businesses drew down their inventories, to 27.5 vs. July's 25.4, and have yet to show any indication that they intend to rebuild their inventories. New orders, which point to future production, increased strongly in August, to 52.5 for a 4-1/2 point gain. The gain in production and gain in new orders have to yet significantly slow the pace of layoffs as the employment index shows severe month-to-month contraction at 38.7, still nevertheless a nearly 2-1/2 improvement from July. As I mentioned in the piece below, manufacturing is looking good. This is further evidence of that.